In the last RIPE Labs article on this subject How Does the Internet Industry Compare?, we looked at ways to compare our industry with other industrial sectors, and identified a number of characteristics that an industry must have in order to be comparable to the Internet industry. It seems the financial sector or monetary credit industry shares many of these characteristics and in fact behaves much like the Internet industry. the absolute size of the user base and the varying demands of individual users. In the illustration below we provide a side-by-side comparison of equivalent portions of the EU monetary financial sector on the left and the universe of RIPE NCC IPv4 address recipients on the right. 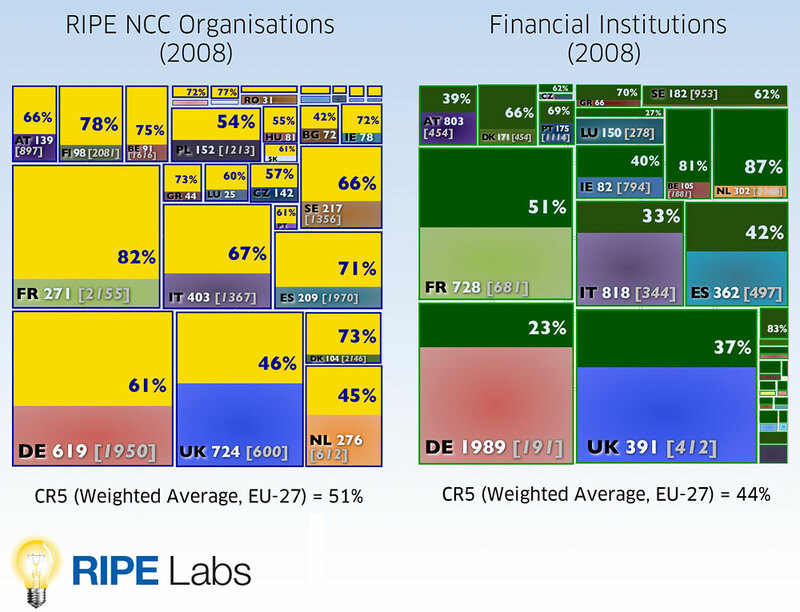 The top area (yellow on the left and green on the right) shows how much of the resources is held by the top 5 organisations in that country (also referred to as CR-5). 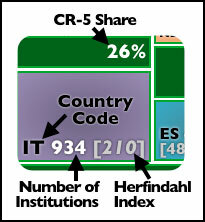 The square underneath shows the country code, the total number of industry members in that country and the HHI score (Footnote: For more information on the HHI, see related pdf) for the country (space permitting). The size of the country's area in the overall image represents the share of total Eurozone-area resources held by industry members from that particular country. The HHI shows that the Internet industry in the majority of the countries has become more diversified over time (For some countries that is different, and that is usually where broadband Internet access service has favoured the owners of last mile facilities). In the banking industry on the other hand, market structures became more consolidated over time. Local Time: Tuesday, April 23, 2019 09:42 PM PDT – Page Load: 0.3142 Sec.